(Nanowerk News) The silver used by Beth Gwinn’s research group at UC Santa Barbara has value far beyond its worth as a commodity, even though it’s used in very small amounts. The group works with the precious metal to create nanoscale silver clusters with unique fluorescent properties. These properties are important for a variety of sensing applications including biomedical imaging. 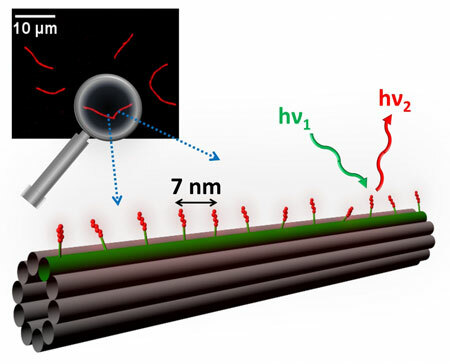 The team’s latest research is published in a featured article in this month’s issue of ACS Nano ("Atomically Precise Arrays of Fluorescent Silver Clusters: A Modular Approach for Metal Cluster Photonics on DNA Nanostructures"). The scientists positioned silver clusters at programmed sites on a nanoscale breadboard, a construction base for prototyping of photonics and electronics. “Our ‘breadboard’ is a DNA nanotube with spaces programmed 7 nanometers apart,” said lead author Stacy Copp, a graduate student in UCSB’s Department of Physics. 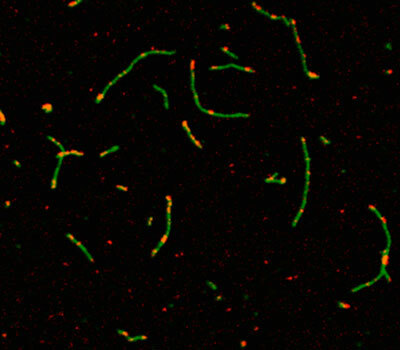 DNA nanotubes decorated by silver clusters with DNA-programmed color. The colors of the clusters are largely determined by the DNA sequence that wraps around them and controls their size. To create a positionable silver cluster with DNA-programmed color, the researchers engineered a piece of DNA with two parts: one that wraps around the cluster and the other that attaches to the DNA nanotube. “Sticking out of the nanotube are short DNA strands that act as docking stations for the silver clusters’ host strands,” Copp explained. Left: The docker (green) appended to one of the strands that forms the nanotube; right: linkers and dockers are spaced 7 nm apart. The research group’s team of graduate and undergraduate researchers is able to tune the silver clusters to fluoresce in a wide range of colors, from blue-green all the way to the infrared — an important achievement because tissues have windows of high transparency in the infrared. According to Copp, biologists are always looking for better dye molecules or other infrared-emitting objects to use for imaging through a tissue. The modular design presented in this research means that its step-by-step process can be easily generalized to silver clusters of different sizes and to many types of DNA scaffolds. The paper walks readers through the process of creating the DNA that stabilizes silver clusters. This newly outlined protocol offers investigators a new degree of control and flexibility in the rapidly expanding field of nanophotonics. DNA controls the size, shape and fluorescent color of the silver clusters themselves. The overarching theme of Copp’s research is to understand how DNA controls the size and shape of the silver clusters themselves and then figure out how to use the fact that these silver clusters are stabilized by DNA in order to build nanoscale arrays.